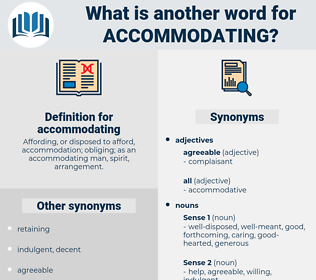 What is another word for accommodating? flexible, forthcoming, enabling, attentive, helpful, favourable, supportive, responsive, conducive, obliging, sympathetic, favorable, beneficial, adaptable, propitious, inclusive. catering, locating, Tolerating, integrating, complementing, conciliating, coordinating, co-ordinating, assimilating, Appreciating, reacting, Containing, attending, Noting, matching, inviting, complying, conforming, filling, Attracting, embracing, integration, uniting, Amending, Adopting, absorbing, dealing, account, accounting, Defraying, customizing, Inserting, arrangements, Comprising, Adhering, opening, reckoning, Consisting, Fulfilling, Adding, redressing, consenting, Harmonizing, Aggregating, arrangement, bedding, Condoning, Practising, Embedding, internalizing, Heeding, conveying, assuming, quartering, respect, Respecting, confronting, settling, facing, Storing, narrowing, Favouring, harmonising, boarding, abiding, hiding, reprocessing, resettling, composing, harbouring, answering, arranging, Placing, home, organising, Instituting, Capturing, Recognizing, Appending, Undergoing, recognising, foster, fostering, gearing, observing, Replying, benefiting, weighing, servicing, Involving, grappling, cooking, mixing, honouring, Receiving, Valuing, Dialing, installing, sleeping, holding, Staying, imposing, juggling, upholding, aligning, Discounting, filing, bringing, Awaiting, re-housing, inputting, inhaling, sucking, Abusing, Bridging, Experiencing, Plugging, tuning, counting, controlling, closing, grouping, going. 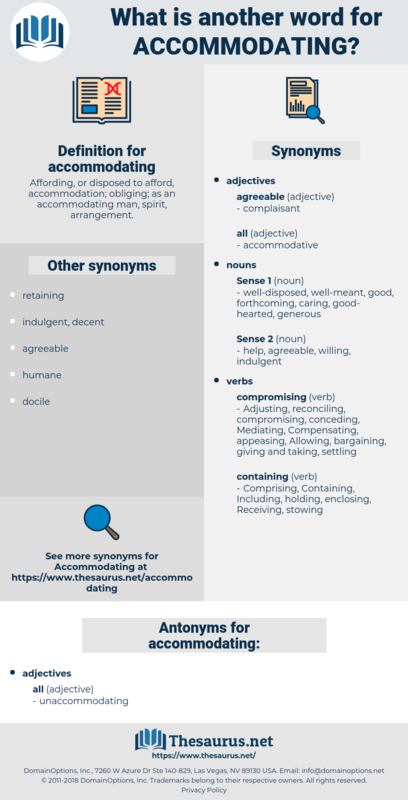 Incorporating, accepting, Addressing, handling, Responding, Admitting, reflecting, tackling, Acknowledging, satisfying, Overcoming, Mainstreaming, meeting, Permitting, Treating, Allowing, Sheltering, Attaching, Furthering, welcome, welcoming, greeting, serving, host, Hosting, hosted, practicing, Considering, lodging, Establishing, agreeing, staging, encourage, Organizing, housing, pleasing, taking, Harboring, rehousing, fund, making, enabling. This innovation was reluctantly introduced solely for the purpose of accommodating visitors in the winter when the hydraulic systems were shut down due to freezing weather.
" I'll try," said the accommodating " Red." ascendence, ascendance, assenting, accountancy, accounting, accenting, ascending, ascendency, ascendancy, acquaintance.